to 1937 in Russia, extensive scientific work on rocket engine design occurred in Leningrad at the Gas Dynamics Laboratory there. Well-funded and staffed, over 100 experimental engines were built under the direction of Valentin Glushko. The work included regenerative cooling, hypergolic propellant ignition, and fuel injector designs that included swirling and bi-propellant mixing injectors. However, the work was curtailed by Glushko's arrest during Stalinist purges in 1938. Similar work was also done by the Austrian professor Eugen Sanger who worked on rocket-powered spaceplanes such as Silbervogel (sometimes called the 'antipodal' bomber.) On November 12, 1932 at a farm in Stockton NJ, the American Interplanetary Society's attempt to static fire their first rocket (based on German Rocket Society designs) failed in a fire. In 1930s, the Reichswehr (which in 1935 became the Wehrmacht) began to take an interest in rocketry. Artillery restrictions imposed by the Treaty of Versailles limited Germany's access to long distance weaponry. 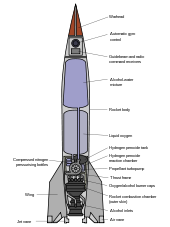 Seeing the possibility of using rockets as long-range artillery fire, the Wehrmacht initially funded the VfR team, but because their focus was strictly scientific, created its own research team. At the behest of military leaders, Wernher von Braun, at the time a young aspiring rocket scientist, joined the military (followed by two former VfR members) and developed long-range weapons for use in World War II by Nazi Germany.